The flail toe or floppy toe deformity is a condition in which one or more toes of a foot lack stability and structural integrity as the result of excessive bone loss (from surgery, infection, trauma, or tumor) and/or gross motor instability from resection or overlengthening of the tendinous structures to the toe. Excessive resection of bone during the performance of a proximal interphalangeal joint arthroplasty is the most common etiology, but the actual rate of flail or floppy toe following the arthroplasty procedure has not been reported in the literature . The flail or floppy toe deformity should be differentiated from a floating toe deformity or syndrome. McGlamry  defined “floating toe syndrome” as a condition in which one or more toes on a foot fail to purchase the weight-bearing surface of the ground during stance or gait. The floating toe deformity is typically at the level of the metatarsophalangeal joint and results from insufficient loading of the plantar plate during stance and gait. Floating toe deformity is commonly seen following shortening or elevating metatarsal osteotomies; following a plantar plate tear, with congenital brachymetatarsia; or following any condition that causes the flexor mechanism and plantar plate of a toe to function inadequately and improperly load during weight-bearing. Myerson MS, Filippi J. Interphalangeal joint lengthening arthrodesis for the treatment of the flail toe. Foot ankle Int [Internet]. 2010 [cited 2016 Jan 11];31(10):851–6. Available from: http://www.ncbi.nlm.nih.gov/pubmed/20964962. McGlamry ED. Floating toe syndrome. J Am Podiatry Assoc [Internet]. 1982 [cited 2016 Jan 11];72(11):561–8. Available from: http://www.ncbi.nlm.nih.gov/pubmed/7142651. Mahan KT, Downey MS, Weinfeld GD. Autogenous bone graft interpositional arthrodesis for the correction of flail toe. A retrospective analysis of 22 procedures. J Am Podiatr Med Assoc [Internet]. 2016 [cited 2016 Jan 11];93(3):167–73. Available from: http://www.ncbi.nlm.nih.gov/pubmed/12756306. 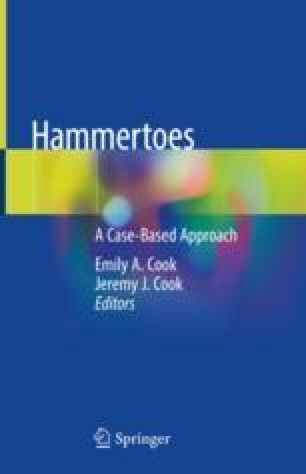 Marek L, Giacopelli J, Granoff D. Syndactylization for the treatment of fifth toe deformities. J Am Podiatr Med Assoc [Internet]. 1991 [cited 2016 Jan 11];81(5):248–52. Available from: http://www.ncbi.nlm.nih.gov/pubmed/2061821. Stewart WP. Syndactylism in podiatric surgery. Clin Podiatr Med Surg [Internet]. 1986 [cited 2016 Jan 11];3(1):65–76. Available from: http://www.ncbi.nlm.nih.gov/pubmed/2937524. Sgarlato TE, Tafuri SA. Digital implant arthroplasty. Clin Podiatr Med Surg [Internet]. 1996 [cited 2016 Jan 11];13(2):255–62. Available from: http://www.ncbi.nlm.nih.gov/pubmed/9118016. Mahan KT. Bone graft reconstruction of a flail digit. J Am Podiatr Med Assoc [Internet]. 1992 [cited 2016 Jan 11];82(5):264–8. Available from: http://www.ncbi.nlm.nih.gov/pubmed/1640375. Lamm BM, Ades JK. Gradual digital lengthening with autologous bone graft and external fixation for correction of flail toe in a patient with Raynaud’s disease. J Foot Ankle Surg [Internet]. 2009 [cited 2016 Jan 11];48(4):488–94. Available from: http://www.ncbi.nlm.nih.gov/pubmed/19577729. Mahan KT, Hillstrom HJ. Bone grafting in foot and ankle surgery. A review of 300 cases. J Am Podiatr Med Assoc [Internet]. 1998;88(3):109–18. Available from: http://www.ncbi.nlm.nih.gov/pubmed/9542352. Myerson MS, Filippi J. Bone block lengthening of the proximal interphalangeal joint for managing the floppy toe deformity. Foot Ankle Clin [Internet]. 2010 [cited 2016 Jan 11];15(4):663–8. Available from: http://www.ncbi.nlm.nih.gov/pubmed/21056864.